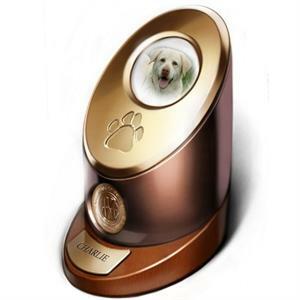 Officially licensed by the American Kennel Club™, this elegant urn is made of burnished copper and bronze die-cast aluminum. An imprinted paw print and photo window has been designed into the top of the urn for a prominent display. The AKC logo is embossed on the face of the metal casing using the manufacturer's own liquid gold formula. The base has a highly-polished clear coat finish offering the appearance of wood. A metallic nameplate, which attaches to the base, is provided with urn so that you may have the plate engraved locally. Closure: Back attaches with screws.